Leading North American implementer of IBM Maximo products and operational improvement firm recognized for its strategic asset management system implementations, consulting and training solutions. Companies become part of the PROFIT 500 through innovative thinking, smart strategy and sheer grit. For the third year in a row, Ontracks Consulting has been ranked by Canadian Business and PROFIT as one of Canada’s Fastest-Growing Companies, the prominent Canada-based media entities recognizing the leading North American implementer of IBM Maximo products and operational improvement firm for its strategic asset management system implementations, consulting and training solutions. The announcement comes on the heels of Ontracks opening a new office in Edmonton in addition to being named one of Alberta Venture’s top 50 fastest-growing companies. Ranking Canada’s Fastest-Growing Companies by five-year revenue growth, the PROFIT 500 list profiles the country’s most successful growth organizations. 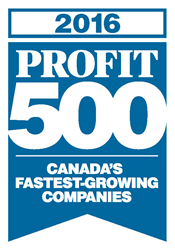 A joint venture between Canada’s premier media brands, the PROFIT 500 is published in the October issue of Canadian Business and online at PROFITguide.com. Ontracks Consulting made the 2016 PROFIT 500 roster based on a five-year revenue growth of 339%, placing 177th on the list. Ontracks Consulting currently employs over 50 individuals and continues to grow, even with regard to its impressive client roster which includes a plethora of firms in the Oil and Gas, Energy and Utilities, Manufacturing, Transportation, Government and Education, Healthcare and Biotechnology, Construction and Real Estate, Mining and Minerals, Retail, Chemicals and Information Technology industries. Ontracks Consulting is a leading implementer of IBM’s Enterprise Asset Management product Maximo and operational improvement firm, working with clients around the world to improve their operational performance. Ontracks focuses on delivering enterprise implementations and helping clients realize tangible and sustainable operational improvements. Ontracks Consulting’s main Canada office is located at Suite 202, 14127-23 Avenue NW in Edmonton, Alberta T6R 0G4 and can be reached by calling (780) 637-4130. For more information, visit http://www.OntracksConsulting.com.